I took the week off work this week, which means I have some time to catch up on my blogging. I made these donuts back in October. Back then, we were doing good with making donuts at home on Saturday mornings. It's a tradition we've been slacking on the past month! I picked up this cake mix from Target. I had never seen it before and knew I could put it to good use, not really having an idea what I would make with it. Since there was an icing that paired with it, I picked it up too. While going through my cake mixes to see which one I was going to use for donuts, I decided to give this one a try. I was hoping they would be the perfect fall donut. The baked donuts are so simple to make. This is the recipe I used as my guide for making these donuts. I was very pleased with how they came out. Hubs preferred the chocolate ones, but my mom and I enjoyed these. Definitely perfect for a cool fall morning. Enjoy! Put about half of the container of frosting in a microwavable bowl. Microwave for about 20 seconds and stir. Repeat until the frosting is melted enough for you to easily dip and coat the donuts. After I was done with the frosting, I let them cool a bit. I've been meaning to post this recipe for weeks now. I made it for hubs to bring to work for a recent potluck. I look forward to his potlucks at work. Now that I am not teaching or living close to family and friends, I don't have as many people to bake for. I don't like to bake just for hubs and I because we end up eating it and we don't need all the sweets I make! I found this recipe on one of my favorite bloggers, The Mix and Match Mama. She calls this treat Thanksgiving in a bar, and I couldn't agree more. It tastes just like pumpkin pie, just in a handy dandy bar. It received 5 star reviews from hubs coworkers and I enjoyed the piece I kept at home for myself. I will be making this every year from here on out. Enjoy!! Grease a 13x9 inch baking dish with Pam. In a mixing bowl, combine cake mix, veggie oil, and 2 eggs with an electric mixer. Spread mixture across the bottom of your pan. In a second mixing bowl, cream together your butter and sugar. Slowly beat in your remaining 2 eggs and vanilla. 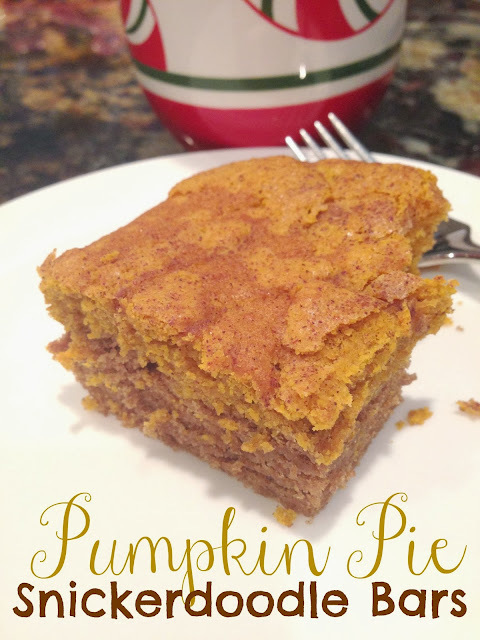 In a smaller bowl, combine your baking powder, pumpkin pie spice and flour with fork. Slowly beat this dry mixture into your butter mixture. Beat in your pumpkin. Spread the pumpkin mixture down on top of your cake mix layer in the pan. Mix the extra TBS of pumpkin pie spice and sugar together. Sprinkle mixture over the top of the pumpkin mixture. Bake 38 to 40 minutes. Let your bars cool at least one hour before slicing and serving. One of my favorite Halloween candy is the Caramel Apple Milky Way's. I thought they would be perfect to add to this recipe. If you make this any other time of year, you may not be able to find them. In that case, add another snickers bar to the recipe. I wish I had a better picture of the finished product. I made it at our friends house, so all I had was my phone when it was finished. This was the perfect dessert for a BBQ. It was light, refreshing with the chopped apples and sweet. The candy pieces were of course my favorite. I'm glad we left the leftovers at the BBQ or else I would have devoured the rest! Chop apples, milky way and snickers into cubes; set aside. Whisk together pudding mix, milk, and cool whip until creamy and with no clumps. Stir in apples and snickers. Lastly, drizzle the caramel topping over the entire salad. Chill for an hour in the fridge. I find myself making the same side dishes week in and out. We find one thing we like and make it over and over again. 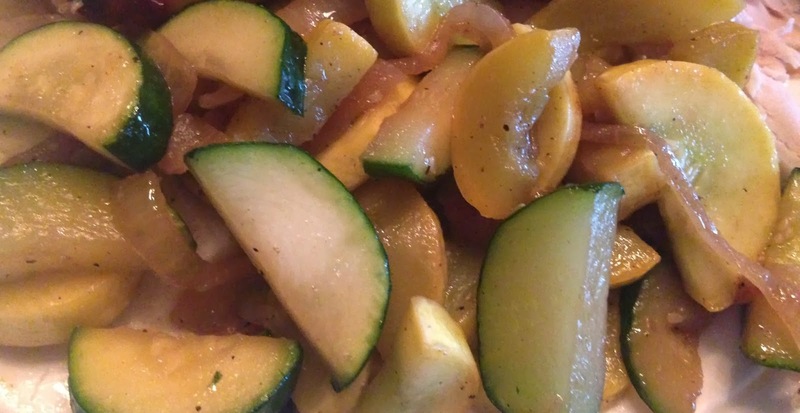 With zucchini and squash, I usually sauté or bake it with a sprinkle of italian spices, parmesan cheese and a little EVOO. When I saw this on Pinterest (where else?) I decided to change things up. This was definitely a sweet side. It was toddler and hubs approved, but because of the sugar (even though it's not a lot), not something I'll make all the time. Definitely work making though! Slice the squash into 1/2-inch rounds, cutting large ones in half. You should end up with roughly 2 cups of cut squash. Cut the onions into similar-sized slices. Add the butter to a wide sauce pan that has a lid and heat over medium heat. When the butter has melted, add the onions and cook until soft, about 4-5 minutes. Add squash, salt, pepper, and brown sugar. Stir, then cover and cook for about 20 minutes, until squash is very soft. Remove the cover and continue to cook for about 8 minutes, just to give the juices a chance to evaporate slightly. There will be some liquid in the pan, but it should be thicker than water, almost like a glaze. Season with more salt and pepper, if needed, and serve immediately. 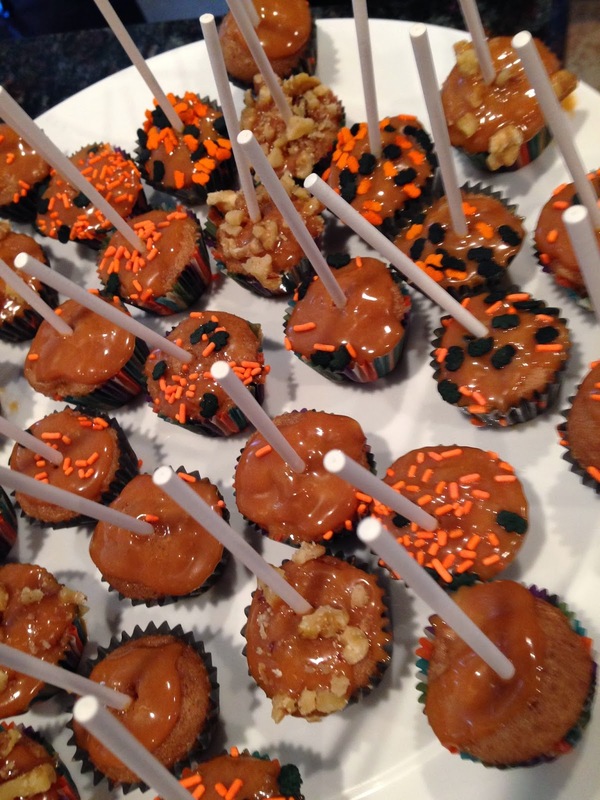 I made these mini cupcakes for a Halloween playdate. There were a bunch of little ones in attendance along with their moms. 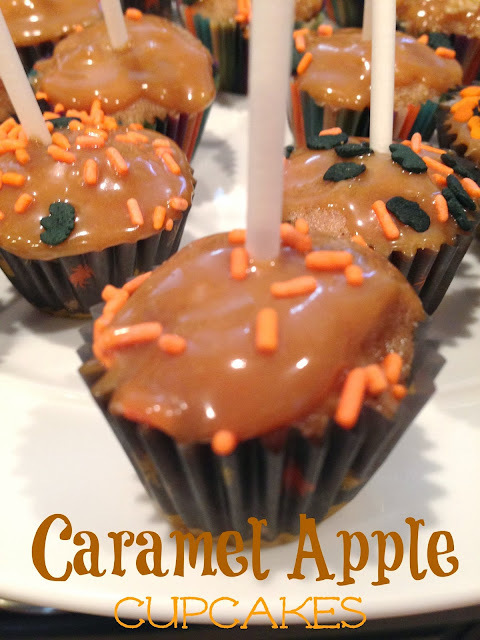 I wanted to make a treat that was festive, tasty and easy to eat. One that both the kids and adults could enjoy. These fit the bill and didn't disappoint. 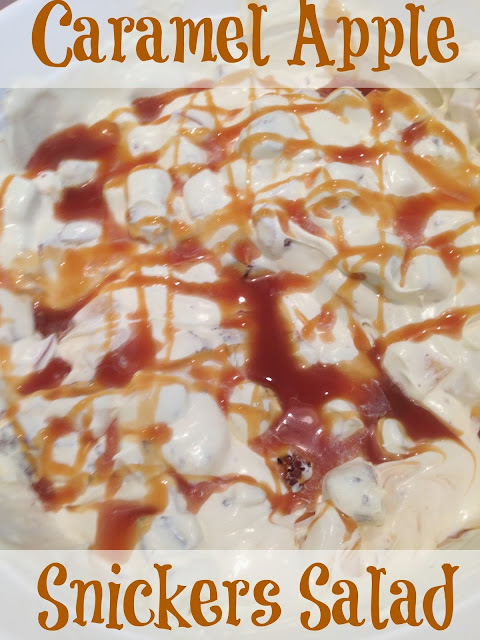 The hardest part of the recipe was the caramel. It dried really fast, so I had get my husband to help me put the toppings on before it dried. These would be great for class parties or even Thanksgiving potlucks. Enjoy! Prepare cake batter according to package directions; fold in apples. Fill 48 greased or paper-lined mini muffin cups three-fourths full. Bake at 350° for 8-10 minutes or until a toothpick inserted near the center comes out clean. Cool for 10 minutes before removing from pans to wire racks to cool completely. In a small saucepan, cook the caramels and milk over low heat until smooth. Spread over cupcakes. Sprinkle IMMEDIATELY with toppings. Insert a wooden or craft stick into the center of each cupcake.